The New England Patriots players got an extra day off to recuperate after Sunday’s 24-10 victory over the Minnesota Vikings. Occasionally, even though the slogan “No Days Off” is attached to the Pats every season, Pats head coach Bill Belichick occasionally gives his team a “Victory Monday” which means they have the Monday after a game off. 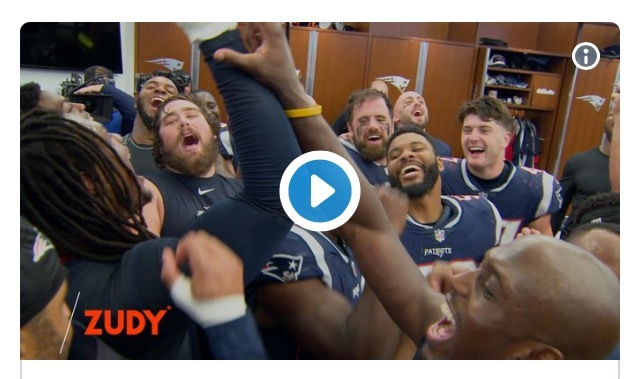 After every win, the Pats have cameras rolling inside the locker room that show the postgame celebrations and this week after Belichick addressed the team, you could hear murmurs about a “Victory Monday” from players. Belichick finally gives the thumbs up, and the players went absolutely nuts. The Patriots will go back to work later this week preparing for a road AFC East divisional match-up against the 6-6 Miami Dolphins on Sunday. Celebrating Sunday's win & an extra day off inside the locker room.